Continental E-Series ExpressWash Washer-Extractors deliver unmatched energy efficiency to return dollars to your bottom line. Advanced engineering brings high-speed performance, a simple-to-install freestanding design, unmatched durability, exclusive features and the ultimate in programmability to vended laundries. ExpressWash High-Performance Card- and Coin-Operated Commercial Washing Machines are available in 20-, 30-, 40-, 60-, 80- and 90-pound capacities. ExpressWash commercial washer-extractors boast a unique suspension system and freestanding design that combine to maximize extract speeds reaching up to 405 G-force. The super-speed extract removes more water from each load—reducing the gas consumed to dry a load by up to 65 percent*. Customers can now complete their laundry – wash and dry – in less than 60 minutes. This time-saving convenience is a powerful way to differentiate any store from its competition while increasing its capacity and efficiency per square foot! ExpressWash Washers are designed without a sump—saving up to 3 gallons of water with each fill. In addition to conserving water, the sump-less design also saves the energy required to heat the water. Over the life of the machine, the combined water and energy savings is substantial when compared to machines with an outer tub sump. Continental's exclusive AquaFall and AquaMixer systems further curb water usage. AquaFall releases water into the load via holes in the drum lifters. As the drum turns, lifters release water from above to better penetrate fabric. Most other frontloads use lifters to simply drop fabric into a pool of water at the bottom of the washer drum. With ExpressWash, laundry is saturated from above and below. This unique system cuts water usage and rinse cycle times while improving the quality of the wash. AquaMixer further improves efficiency by mixing hot and cold water before entering the drum. This achieves very precise water temperatures—offering greater control over hot water consumption. The ProfitPlus® Control – which works seamlessly with card technology or coins – brings more washing options and cycle features to the customer. It offers four primary cycle options: SUPERWASH, an extra-long cycle for heavy soil; HOT, for whites; WARM for colorfast and permanent press items; and COLD for colors. It also allows the customer to add an EXTRA WASH, EXTRA RINSE and/or DELICATE CYCLE. ProfitPlus® gives customers what they want—more control over how their laundry is washed. This differentiates your laundry from the competition – helping you attract and retain customers! Using ProfitPlus®, owners gain total control over the wash process! Highly programmable, the control allows owners to lower water, natural gas and electricity usage – cutting operational costs. The ProfitPlus® Control offers four individually modifiable programs that allow programmability of G-force extract, mechanical action, wash temperature (by degree), water levels and wash/rinse/extract time in each phase. The control's flexibility allows multi-level vend pricing on the same machine depending on the wash program selected, time of day, or day of the week. 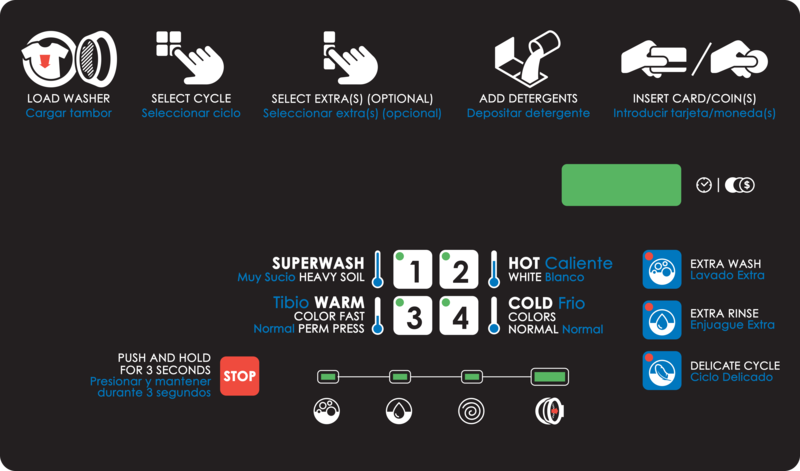 Additionally, owners can now program variables within the EXTRA WASH, EXTRA RINSE and DELICATE CYCLE options, including the extra wash or rinse time in minutes, the addition of another bath, vend price and G-force extract speed. Rather than all day, it takes just a few minutes to program an entire laundry using Continental's new ProfitPlus® vended control. ProfitPlus® integrates networking, remote programming and payment-system interface to make quick programming possible, and in doing so, fulfills a host of owner needs and customer cravings. In seconds, from a remote computer, netbook, iPad or cell phone, owners can configure pricing and specials, run reports, schedule routine maintenance flushes, and monitor the status of the system and equipment in real-time. Owners can instantaneously download the modifications onto specific machines, or an entire store. Suddenly store management is greatly simplified using a lot less time! Available for all older model ExpressWash™, the ProfitPlus® Control Acceleration Kit is an affordable way to significantly improve the profitability, efficiency, programmability and performance of existing washers. The retrofit kit takes just 15 minutes to install on existing washers, offers a quick return on investment and greatly enhances washer profitability, customer appeal and an owner’s ability to quickly program and manage multiple washers simultaneously. The ProfitPlus® Control Acceleration Kit was engineered and designed to improve the profitability of existing washers already installed across North America. Unlike hard-mount washers, ExpressWash are simply installed without concrete foundations and bolts. Just slide into place, level and connect utilities. It's possible thanks to the Multi Directional Spring (MDS) system that absorbs 95 percent of the machine's vibrations. No longer is store location dependent upon concrete foundation availability. 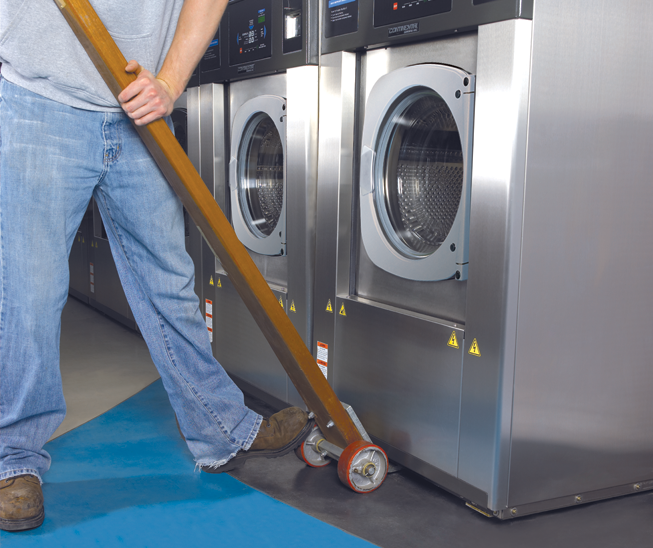 ExpressWash Washers can be installed in unconventional locations including areas with wood and above ground-level laundries*—all with little or no floor preparation and cost. Moreover, ExpressWash Washers can be moved easily and many models operate using single-phase power—making installation and operation simpler and less costly. We've simplified maintenance requirements on our E-Series ExpressWash line, and simultaneously, improved accessibility to components. The top panel of the washer can easily be removed without interfering with detergent dispensers, and the drain is easily accessible via the removal of the front panel. If service is necessary, the entire machine can easily be pulled away from the bulk head due to its freestanding design. Control diagnostics help owners pinpoint machine errors and needed maintenance; bearings are lubricated for a lifetime; the poly-v belt needn't be tightened; and bearings and seals are easily replaced without removing the washer drum. E-Series ExpressWash Washers feature durable AISI-304 stainless steel inner and outer drums designed for constant use. The front, side and top panels are constructed of steel and coated with Continental's unique Titan Steel Finish™ for superior appearance and corrosion resistance. Each component is engineered with as few welds as possible for unmatched strength. From the rounded cabinet corners to the oversized bearings and quality sealing system, no details were overlooked. The oversized door on ExpressWash, which enables easy loading and unloading, is equipped with a heavy-duty, bolt-style hinge to withstand the rigors of a busy store. An ADA compliant door handle makes your laundry more accessible and an immediate door unlock at the end of cycle signal will help boost customer turnover.